A press brake, also known as a brake press or just brake, is a machine that is used specifically for bending sheet and plate material. Our Hydraulic presses operate by means of two synchronized hydraulic cylinders and utilize CNC controls for precision repeatability. At AH Stock Manufacturing Corp., we offer our customers a solution to all of their manufacturing needs, from engineering to finished products. In addition our press brakes have the ability to bend and form sheet and plate metal in sizes up to 12 feet and can bend up to 150 tons. All of our press brakes utilize the latest in CNC control technology for increased precision, repeatability and reliability. Call us today at 920.726.4211 to speak to one of our friendly and knowledgeable sales professionals. 2 Weidemann Magnum 5000 CNC Punch Presses with material capacity to 3/8" and sizes to 60" x 144". High definition plasma, 52 station turret with auto index and 45 ton capacity. Messer Metal Master High Performance Plasma with a table capacity of 1.25" thick plate and sheet sizes to 96" x 240". 2 Shears with the largest having a capacity of 1/4" steel x 10'. 3 Marvel saws with the largest having a capacity to cut 20" x 24" and 60 degrees in both directions. 20 Wire Welding machines from 300 to 600 amps. Spotwelding capacity to 1/8" material. Metal Rolling capacity of 1/4" x 36.00"
Tube Bending capacity up to 2.00" schedule 40 pipe. Manual Punch Presses to 1.062 diameter thru 1/2" H.R.S. Drill Presses to 2.500" hole diameter and 1.25" tapping capacity. Notching and coping capacity to 60 tons. 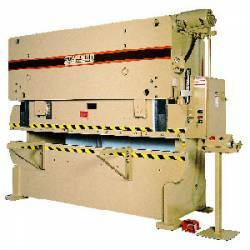 Belt sanding up to 24.00" width and continuous feed. We also have turning and threading equipment and the ability to construct special shipping containers.